Hezbollah arch-terrorist Hassan Nasrallah has called on Lebanon to oust Israel from territory in the Golan Heights. “We call on the state to devise a plan and take a sovereign decision to liberate the Shebaa Farms and the Kfarshouba Hills,” Nasrallah said in a televised speech on Thursday, the Lebanese news site Naharnet reported. Shebaa Farms, which is located along Israel’s border with Lebanon in the Golan Heights and known as Mount Dov, was captured by Israel from Syria in the 1967 Six Day War. While Nasrallah claims that the territory belongs to Lebanon, most of the international community, including Syria, does not recognize this claim. Nasrallah also announced that he made a rare visit to Damascus to meet with Syrian President Bashar al-Assad. “I personally went to Damascus” to see President Bashar al-Assad, Nasrallah said. Since the Second Lebanon War in 2006 the terror chief has rarely left his network of secret bunkers. Nasrallah’s statements come after the terror group declared a victory in its battle against the Islamic State in the border region between Lebanon and Syria. Around 600 Islamic State fighters were forced to leave from the border area and transferred into Islamic State-held territory in eastern Syria. The Hezbollah leader said that the victory thwarted plans by the U.S. and Israel. “Israel and the US’s dreams in the region are based on ISIS and they are collapsing,” Nasrallah said. “The axis of resistance, with Russia’s help, thwarted the American-Israeli plan in the region. The Trump administration has brought diplomatic relations with Russia to its lowest ebb. The US poses the real threat to the world and is preparing to take us into nuclear war,” he continued. Want to do something important for Israel? 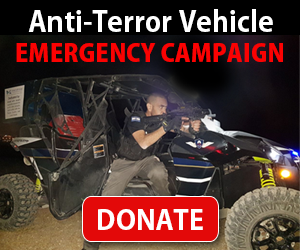 Make a donation to help fight against Palestinian incitement and terror. The Palestinians' self-proclaimed knife intifada is the latest result of ongoing incitement against innocent Israelis. Israelis are being stabbed, shot and run over. Yet the world is silent. Help Israel to fight and win the war against terror. The time to act is now!